Well, they are all chunky little birds with light eyelines, cocked tails, and an inquisitive demeanor. They look like they all just pished up for their photos. In short, they all look and act like wrens. How hard can this quiz be? 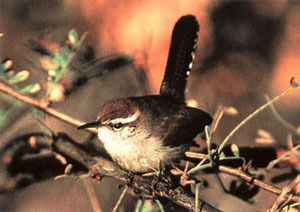 There are only nine wrens in all of North America, only seven possible in Arizona, and each has its own ecological niche. Wrens should be easy. On the other hand, if you look cursorily at a field guide with many or all of the wrens on the same plate, it takes on the diabolical aspects of the comic page feature which asks you to find dissimilar details in two seemingly identical scenes. And many wrens' habitat niches coexist side by side in Arizona. 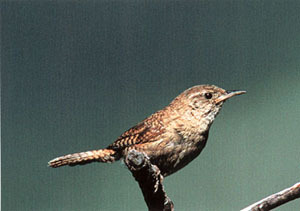 More than once I have seen seven wren species at Boyce-Thompson Arboretum in a winter morning's birding. And wrens all like low, dark, tangled places. And there are some other species which seem like they belong in the family--watch a dipper pick through rock rubble at a rivulet's edge. Here's the model wren from the original wren mold, before the Wren Creator got creative and tried bigger castings, brighter hues, and sharper contrasts. All the original parts are here--the thin, slightly decurved bill, the supercilium (eyeline), the white eyering, the light throat fading into a darker belly, the finely barred wings, tail, and flanks. Subsequent wren models have many or all of these features, but usually in larger, bolder, less subtle wrenditions. We can eliminate Carolina, Bewick's, Marsh, Sedge, and Cactus by virtue of their much thicker, much brighter eyelines which reach their widest point behind the eye and continue wide to the back of the head rather than tapering and blending. We can eliminate Winter, for which the Wren Creator simply took the original and clipped off half the tail. We can eliminate Canyon with its proportionately longer bill and sharp contrast between breast and belly. We can eliminate Rock with its upright, vertical posture and its greater contrast between upper and underparts. The House Wren, Troglodytes aedon, is truly a troglodyte, the original skulker, slipping behind bark crevices, poking in and out of natural riprap, disappearing for minutes at a time in dank duff piles, foraging in spidery place for its favorite food morsels. I knew this bird was there, beneath the dense brush in which I had photographed our House Wren, long before I saw it. The sun had just cleared the eastern horizon, the winter chill was still muting the "dawn chorus," and there was the faintest scritching in the tangle of leaf litter, accompanied by perceptible but unidentifiable movement. Then the House Wren popped up, posed, flipped away. I thought it the House Wren, but the scritching continued. The bird began to scold, as if the House Wren's movement had set it off. Then it too flitted up into the open. The first thing I said to myself, seeing the cocked tail and the assertiveness, was "wren." The second thing I said, a second later, seeing the big, bold eyeline and hearing the querulous scolding, was "Bewick's." The third thing I said, another second later, cannot be printed in a family newsletter. The cocked tail, shouting "wren!," was much too long for Winter. The supercilium quickly eliminated any mate our House might have conjured in its spidery search of winter territory. Cactus? The breast was spotless. Marsh? In wooded river bottom? Possible, but there were no reedy or grassy areas along this riparian stretch. Sedge? Give me a break! It was plump, even for a wren. Carolina! Carolina was the closest visual match! My free falling brain dredged up vague memory of a Carolina in New Mexico in the fall. Get out of here! But that supercilium was just riveting, even in the shadows. The bird was wigging out now, pumping up and down, flipping right, flipping left just like a thousand Bewick's you've pished. I settled on Bewick's. That took two seconds. By the third second the sun had crept past an intervening limb and the bird's frenetic inquisition had propelled it into a thin sunshaft. The cloak of shadows fell away, but the wren's wing and tail barring did not materialize--there was none! The back was drab--drab green! And that's not a wren's bill is it? Much too short and blunt. At the bottom of Sycamore in April of '94 we had dubbed this the "Easter egg bird." Only a kid coloring Easter eggs would dye impossibly yellow next to incredibly cinnamon on the same egg. How must the Wren Creator's skills have evolved before He thought to place these colors and a chat's bill on a wren mold? How must our verbal skills have devolved to call this awesome little bird, simply, Rufous-capped Warbler? A very large but not immediately obvious problem in bird photography is that a majority of birds are very contrastingly colored. Film just cannot handle this, cannot always recreate the range of light the human eye discerns. If you had a light and dark bird to be photographed in a lit and shadowed scenario, both logic and film would dictate placing the light part of the bird in the shadows, the dark part in the light. But the birds don't give a rip, and they ain't posing. Here's the light part of a wren in the sun, the dark part in the shadows. Close. In focus. My eye said "dynamite!" This print says, "Dummy, you messed up again." But . . . it is diagnostic--thin, decurved bill, bright eyebrow, light eyering, dark, cryptic dorsal (upperparts) over light ventral (underparts), and if you look carefully you can see the fine barring on the wings and the jauntily cocked, short, rounded tail. The supercilium eliminates House and Winter, Canyon and Rock. Geography eliminates Carolina and Sedge, at least until there is a first state record. The unmarked breast certainly eliminates Cactus. We must choose between Bewick's and Marsh. Not so easy in black and white. Not so easy after seeing Marsh Wrens at Patagonia Lake this winter leave their marsh habitat, periodically flying to nearby deciduous and gleaning for insects in the bark crevices, several times feeding in the same tree at the same time as Bewick's. Never encountered before by me, this was an obvious example of winter opportunism. But what's missing here, were this a Marsh Wren, is a diagnostic feature we all overlook, so complacent have we become in identifying Marsh Wren simply by habitat and voice. Marsh Wren will always show white streaks against the dark upper back, and these would surely be light and contrasty enough to show even in the shadows here. Bewick's is typically a drabber, colder wren than Marsh which, in good light, shows off its warm buff to rust tones in scapulars, lower back, and flanks. These wrens and their smashing family impersonator were shot along the river below the San Pedro River Inn this past December, all in the same bush, all within half an hour. Before we leave the wrens let's revisit that comic feature. What if we took our final quiz bird, Bewick's, sprayed it with all the Marsh's warm tones, then transposed the Marsh's light on dark back stripes to dark on light neck stripes? THE WREN CREATOR HAS DONE THIS! He has set this model down an hour's drive south of the Mexican border, and we have labeled it Sinaloa Wren. As Roy Jones wrote in the December, 1998 issue of BIRDING, he and a panel of other southwestern experts think it is coming to a canyon near you. Wrens may not be so easy after all. Look carefully!